Southern Pacific Inflatables specialises in durable, light weight aluminium tenders,and the Puffin RIB is our proven flagship model. 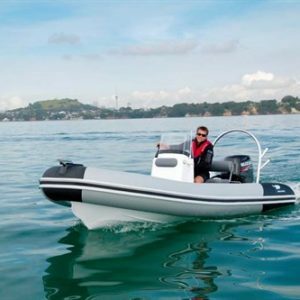 The ultra light, Kiwi-made aluminium tender Southern Pacific Inflatables specialises in durable, light weight aluminium tenders,and the Puffin RIB is our proven flagship model. Weighing in at a very user-friendly 23kg and 25kg, the 240 and 260 RIB are easily handled and will plane with just a small amount of power. Pressed hull rakes on quality aluminium hull and thermally welded VALMEX® PVC tubes make for a safe, dry ride. New features include; Railblaza rowlock fittings with the ability to fit rod holders and other accessories, light weight oars and sharp new styling and colours. 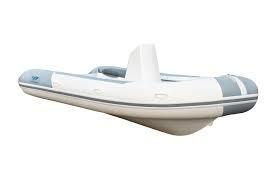 Welded lifting points and soft edges throughout make the Puffin RIB a perfect tender for your launch or yacht. 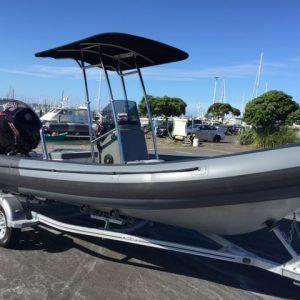 Pack down size length 2.18m 7'1"
Southern Pacific Inflatables specialises in durable, light weight aluminium tenders,and the Puffin RIB is our proven flagship model. 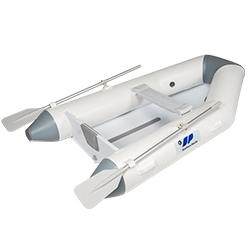 Weighing in at a very user-friendly 23kg and 25kg, the 240 and 260 RIB are easily handled and will plane with just a small amount of power. Pressed hull rakes on quality aluminium hull and thermally welded VALMEX® PVC tubes make for a safe, dry ride. New features include; Railblaza rowlock fittings with the ability to fit rod holders and other accessories, light weight oars and sharp new styling and colours.